More women have been promoted to corporate executive positions in recent months, according to CEO Score, a site that appraises corporate management. There were 65 job promotions for women among a total of 1,968 at the top 30 business groups from November last year to Jan. 18. The number of women also accounted for 3.3 percent of all executive-level promotions, marking the first time it has crossed the 3 percent threshold. The proportion was 2.3 percent in 2017. 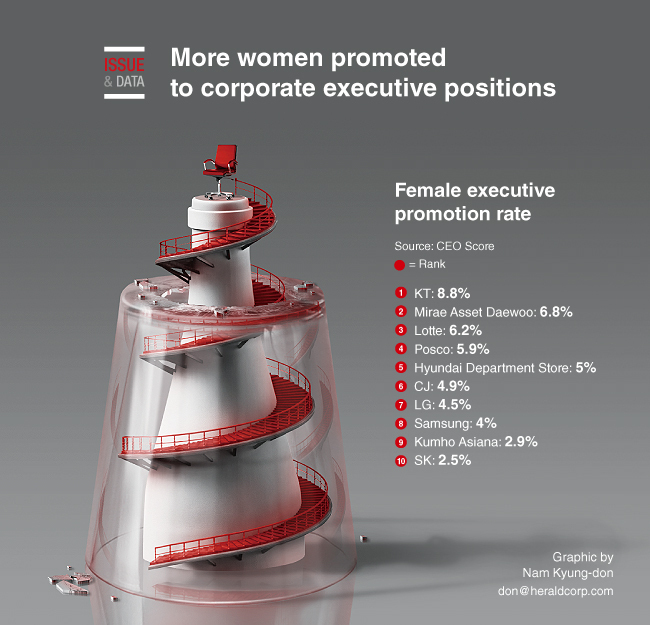 KT, the country’s largest telephone company, had the largest proportion of women in its promotions, with 8.8 percent. Mirae Asset Daewoo came next with 6.8 percent, followed by Lotte with 6.2 percent and Posco with 5.9 percent.